This pretty little sponge cake is delicately light, delightfully fruity and quite frankly scrumptious. Don’t be afraid of attempting the ever-so daunting sponge and it’s poorly understood pal, the passionfruit curd. Both recipes may seem like technical challenges beyond your reach, but I’ve detailed a few key steps that should allow you to sail straight to baking bliss. And the result is worth it; the slight tartness of the passionfruit curd and fresh blueberries are a wonderful complement to the velvety whipped cream, which I’ve laced with vanilla bean. Served up with a cup of tea on a warm summer’s day, this cake couldn’t get any more… lovely. Before you raise your eyebrows in suspicion of this cake’s unusual secret ingredient, let me argue its case. I was served this Dark Chocolate and Beetroot Cake upon arrival in London last year. It was baked lovingly by my cousins, drizzled with dark chocolate ganache and intricately decorated with a white chocolate welcome message. I was so taken aback by how incredibly rich and velvety the first bite was. The idea is not to actually taste the beetroot, but there is a dark, seductive, earthy tone to the cake that is utterly delicious. 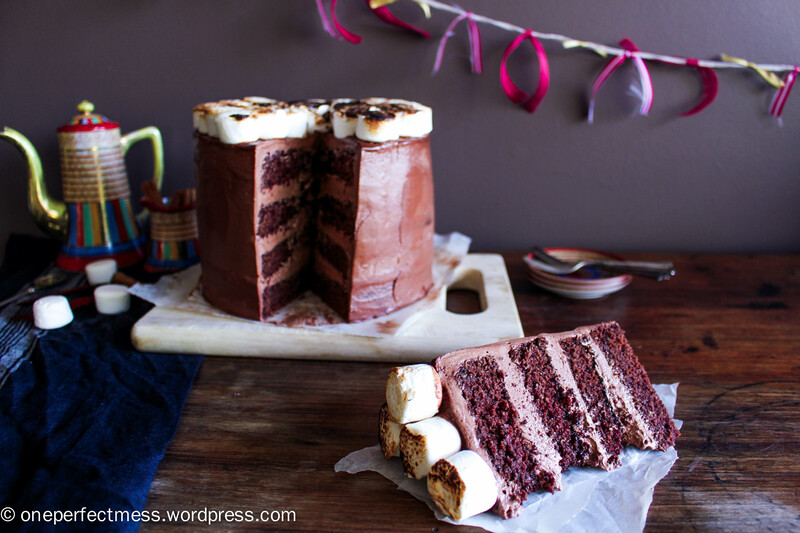 This is no ordinary chocolate cake; the four layered tower is held together by a rich and velvety dark chocolate buttercream, laced with cinnamon and chilli, and topped with toasted fluffy marshmallows. The result is a subtle, intriguing and devilishly delicious combination of sugar, spice and heat. A Mexican Hot Chocolate Cake that promises seduction, fascination and admiration. On a separate note, it’s ridiculously fun setting fire to the marshmallows just prior to serving. Technically you should hold a flame torch/match over the marshmallows until they just start to toast. But obviously I got a bit overexcited by my new toy, and ended up frantically blowing out the flames that threatened to engulf my latest creation! Not sure I’m old enough to play with fire without supervision.